Bitcoin surprised the world and rallied after the SEC postponed a decision on the Van Eck/ Solid X Bitcoin ETF. At the same time, XRP, ETH and few other altcoins posted impressive gains. Are cryptocurrencies approaching a turning point? This has been a fantastically exciting week for cryptocurrencies. XRP pulled off a 100% gain, Stellar Lumens is on a run and Bitcoin (BTC) 00 managed to briefly pop above $7,800. The crypto-hemisphere is also buzzing with positive news. Tim Draper has returned with his $250,000 Bitcoin price prediction, and Mike Novogratz of Galaxy Digital has called $6,000 the absolute bottom — now believes that $6,800 and $8,800 represent the crucial resistance levels BTC must cross in order to close the year slightly above $10,000. The SEC followed it’s typical process of making public announcements days before the scheduled date. The most recent statement regarding the Van Eck – Solid X Bitcoin ETF is not necessarily negative. According to the SEC, the Commission has not “reached any conclusions with respect to any of the issues involved” and have requested additional commentary on the topic. This has led some to speculate that an approval is forthcoming and the absence of an all-out denial has been interpreted as reason for the current rally — though it’s entirely possible that the market is being driven by the increase in positive news surrounding Ripple. Bitcoin 00 pulled back after touching the $6,800 resistance and appears to be consolidating for the time being. 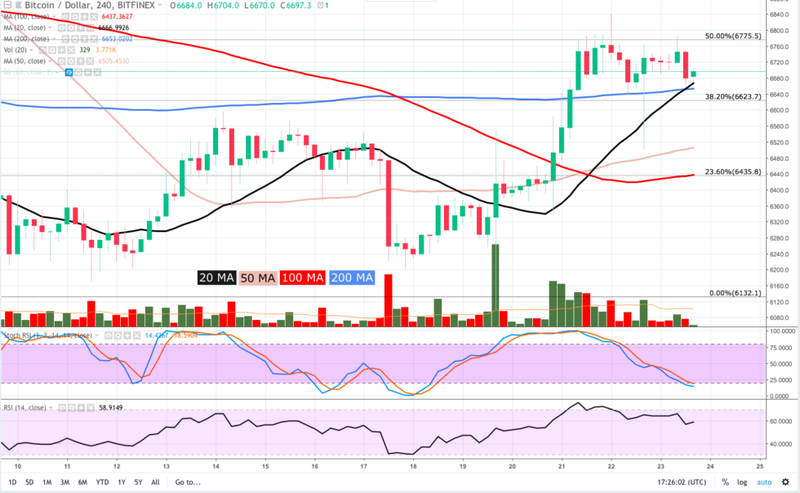 BTC managed to blast above the 20 and 50-MA and 100-MA is functioning as a barrier to $6,800. Volume has dropped off which is typical for the weekend, and the Stoch lines have crossed as the oscillator begins to descend from overbought territory. Bulls are doing a fine job maintaining the short-term supports and buying on the stronger dips. A positive turn of events has been the repeated occurrence of bulls vigorously buying the dips and defended $6,000 — $6,200. At the moment BTC is well situated above the inner and lower ascending trendlines and in the event of a pullback, BTC could fall to the $6,550 and $6,500 support. While unlikely, even a drop to $6,260 keeps BTC above the ascending trendline. BTC 00 has been rejected multiple times at $6,789, and since topping out at $6,800 BTC pulled back to post lower highs. A drop in volume and possible formation of a bear flag could see BTC pullback to the 50-MA at $6,500, followed by the 20-MA at $6,435. The Stoch is en-route to oversold territory with room to fall and the RSI is descending from bullish territory. This week’s rally repositioned the 20-MA above the 50, 100, and 200-MA. BTC remains well situated for the short term. BTC will need to clear $6,780 to regather momentum and make a run toward $7,000. Bitcoin needs to overtake $6,780 and $6,840 in order to maintain momentum and reach $7,000. In the absence of bull volume, BTC could pullback to the 50-MA at $6,500, followed by the 20-MA at $6,435. We will look for volume to pick up as the weekend ends and BTC is likely to have another go at $6,800.